We are truly fortunate to have the team that we do. Most of our staff has over 20 years of experience in dentistry, enabling them to offer our patients the very best when it comes to both service and care. Whether you’re at the front desk or sitting in the treatment chair, they’ll be there to make sure you’re comfortable and looked after every moment. Read on below to learn more about our wonderful team! 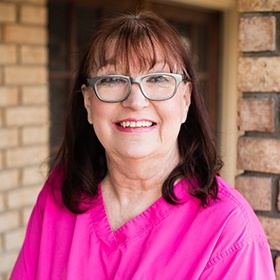 Cynthia’s career in dentistry spans an impressive 44 years so far, and she’s spent the last 21 as a member of our team. She earned her degree in dental hygiene from OU. Even after doing this job for so long, she still genuinely loves it, especially the wonderful patients. Originally from Edmond, Cynthia has two grown daughters. When she isn’t at the office, you can find her watching the Home Shopping Network and QVC. She’s also very active in the Oklahoma Dental Hygiene Association. 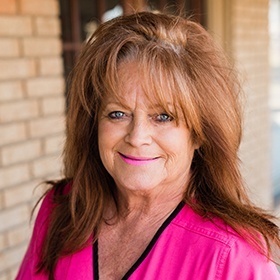 In the past, she served on the Oklahoma Board of Dentistry for seven years. 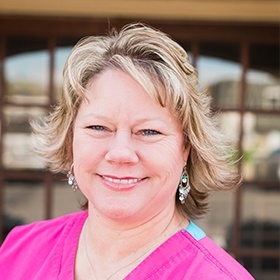 Kam has been working in a dental office since she was just 21 years old! She studied at Rose State and is a Registered Dental Hygienist (RDH). Her favorite part of this job is being able to help and educate patients on a daily basis. Originally from Luther, she has two grown children and four grandchildren. When she has free time, she enjoys doing cross stitch, exercising at the YMCA, reading, baking, and playing with her gray Doberman Zeek. Born and raised in California, Dannell’s career in dentistry spans 30 years and counting. She first joined Dr. Swearingen’s team three years ago. 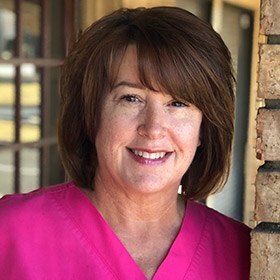 She has undergone advanced training in a wide variety of services, including Invisalign, coronal polishing, X-rays, nitrous oxide, CPR, and esthetics in cosmetic dentistry. Working with such a fantastic doctor and staff is her favorite part of this job by far, as well as meeting new patients and being able to make them feel at ease. 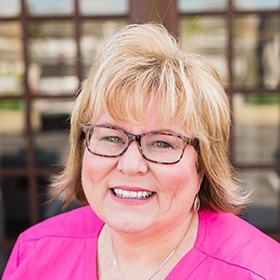 When she isn’t busy at work, Dannell can be found golfing, entertaining, watching OU football, shopping, and spending time with friends and family. She is a very upbeat and positive person who can make people laugh and bring a smile to their day! Donna received her education at East Central University and Rose State College. Today, her career in dentistry spans over 35 years! She is a CDA and certified in radiation protection and safety, coronal polishing, topical fluoride, pit and fissure sealants, and nitrous oxide. She loves dentistry and being able to help patients have a great experience. Her father was actually a dentist, and she started working with him when she was 13, quickly developing a genuine love for assisting. Originally from Davis, Donna has been married to her husband Tom for nearly 28 years. They have two sons named Mason and Garet. In her free time, she enjoys going to church, volunteering, cooking, reading, and watching movies. 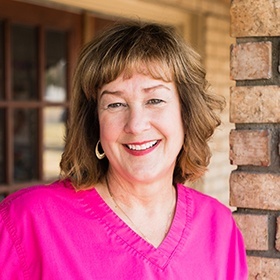 Penny’s career in dentistry spans over two decades now, all of which have been spent here at this practice. In fact, she actually worked with Dr. Swearingen’s wife at a different job before being hired! She attended Southwestern Oklahoma State University in Weatherford and is certified in CPR, dental coding, and reimbursements. She loves getting to know patients personally through her work! Penny is from Clinton and has been married for nearly 30 years. She has a daughter who is a nurse and a son who is an electrician. In her free time, she enjoys playing cards, going to the movies, and watching Thunder games. Lisa attended Oklahoma State University before pursuing her Master’s in Audiology from the University of Oklahoma. She is still licensed and also has her certification in CPR. She loves the people she gets to see and work with every day here at the practice! Lisa is married to Dr. Swearingen, and they have two sons named Garrett and Logan, as well as three dogs. She enjoys traveling in her free time and getting to explore Oklahoma, especially day trips to the Wichita Mountains for hiking. She is also a big reader and always loves being around her family and friends.